I spoke to Megan Suky's from 94.9 KUOW on Tuesday about farmer's markets and shared two recipes from EAT & DRINK in the Northwest, the Christmas Cioppino and the Butternut Squash, Parsnip Quesadilla with Ginger Lime Beet Salsa. The interview was played on Wednesday Dec. 17 on Sound Focus. A link to the show is found here: Sound Focus to hear my little piece, you have to listen or skip ahead almost to the end of the show, although the previous stories before mine are lovely as well. One more sample recipe from EAT & DRINK in the Northwest, Winter edition! Cioppino is one of my all time favorite dishes and it seems fitting to include it as a sample recipe, just in time for Christmas. My family likes to make cioppino for Christmas. Shellfish is at its peak in the fall and winter. You can ask each guest you invite to dinner to bring a ½ pound of seafood to add to the pot. It’s fun as well as cost effective for a large group. This soup is packed with a variety of seafood in a rich tomato, basil and rosemary broth. Served with warmed sour dough bread and you may just reconsider making turkey or ham for Christmas dinner. Place 6 large serving bowls into the oven. Heat 1/4 cup olive oil in a large pot over high heat. Add onions, fennel, and a pinch of salt and pepper. Cook until softened and fragrant for about 4 minutes, stirring constantly. Reduce heat to medium and add garlic and cook another minute, stirring constantly. Add bay leaf and oregano. Stir and cook for 30 seconds. Add tomato paste and stir for 3 minutes. Add chopped tomatoes and stir for 4 minutes. Add white wine, clam juice and stock and bring to a boil. Add parsley, basil and rosemary sprig. Reduce to medium and simmer for 30 minutes. Season with salt and pepper to taste. Add clams and mussels and simmer until they open, about 3 minutes. Add shrimp and scallops and stir. Next, add 2 tablespoons olive oil to a large sauté pan over medium-high heat. Season snapper fillets with salt and pepper and add them to the heated pan. Cook for 2 minutes, flip and cook another minute. Fish will be slightly underdone. Remove serving bowls from oven. Place a seared snapper fillet into each heated bowl. Add crab pieces to the soup and heat through approximately 2 minutes. With a pair of tongs, remove crab legs to serving bowls. Remove bay leaf and rosemary stem from cioppino and discard. Cover fish and crab with a couple of ladles of soup in each bowl. Serve with sourdough bread. Discard any unopened clams or mussels. 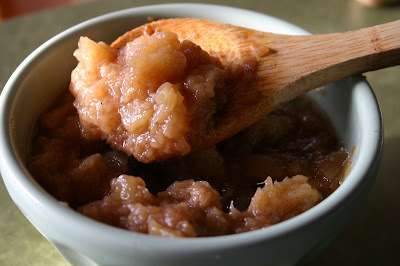 Possibly the most nostalgic smell from my childhood would have to be homemade applesauce. Every fall, my mother made homemade applesauce. The apples usually came from apple trees in our yard or from my grandparents yard. A large bowl of multicolored red, pink and golden apples flecked with pocks and sometimes worm holes was common place in my mother's kitchen. Then the sound of the 1970's red-handled apple peeler and corer would grind, spraying sweet and sticky apple juice on the counter and floor. Chopping and stirring and then the heavenly smell of sauteed apples with cinnamon and brown sugar would coat the air. It would stretch and swell throughout the kitchen, creep into the hallways, living areas and even spread itself out onto the couch and weave its way into the fabric of our clothes. And before my dad would reach the front door of the house, the scent was already welcoming him home. As the end of fall draws near, what better way to remember it then with long lasting flavors. My ultra simple homemade applesauce. Peel and core apples. Thinly slice and rough chop them. Add them to a medium-to large pot over medium-high heat on the stove. Add water and stir. Once the water starts to simmer, reduce heat to med-low and stir. Add cinnamon, nutmeg and salt and stir. Cook over medium low heat for 2 hours, stirring occasionally. Depending on how you like the consistency of your applesauce, cook another hour for softer sauce. Serving suggestions: Eat warm or cold either by itself or on vanilla ice cream or served on the side of stuffed pork chops. Today Marcus and I were featured on Ideal Bite Seattle! A green newsletter for sustainably conscious people on the go. The Roasted Cauliflower and Butternut Squash Pizza was mentioned and it's glamour shot can be found in the article. Here is a link to the story called "Every Trick in the Cookbook" by Amy Pennington, a fantastic writer, gardener and epicurean living in the Seattle area. Last night, Marcus and I were honored to be invited to attend the 3rd Annual Tom Douglas Northwest Cook Book Social. I felt both humbled and excited to be around such incredible chefs. The event sold out quick at 400 people. Each chef brought with them a little taste to share- be it Thierry from Rover's soy-glazed pork belly or Karen Jurgenson and Lora Lee from Quillisascut Farm's hand-made goat cheese on homemade crackers, each chef brought something delicious. I made Red Wine and Fig Spread with Caramelized Pear on Sea Salt Pita Chips with Gorgonzola Cheese and Arugula, a modified sandwich recipe from the first book. It makes me so happy to see so many people as passionate about food and cooking as I am, or at least interested enough to come downtown on a rainy Monday and meet some hardworking chefs and taste some of their inspiration. If nothing else, a great excuse to drink a little vino, meet some great people and cross off some gifts off their lists.